The Nanotech 140GPM is a glass press molding machine designed for precision glass optic applications in both wafer and individual lens form. It features a single molding chamber with a 140mm diameter capacity. 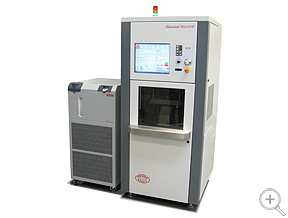 This machine compliments the Nanotech 100UPG which is ideal for ultra precision grinding of WC and SiC mold components. The Nanotech 450UPL or 650FG can also be configured for ultra precision grinding of these molds. Together, the combination of systems forms an ultra precision glass press molding cell.